ike every candidate before her, Zoey had a tough act to follow. And she - along with her sister and VP choice Zero - faced the challenge head-on, once again raising the stakes for future contenders. They not only attracted national attention to the campaign and the Hamster For President cause. They also presided over the first hamster political convention attended by humans. And not just humans, but the really smart ones - literally the rocket scientists and leading scientists and intellectuals of the United States. Zoey, who took politics very seriously, is seen here going over entries she made in a tiny notebook. 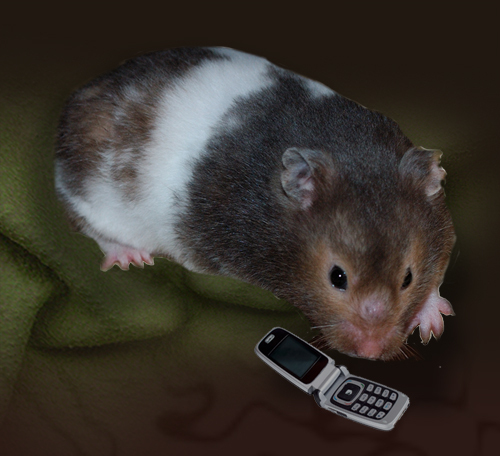 Her meticuous notes cover everything from appointments and scheduling to background facts on important issues and the contact information for experts, hamster and human, who can be called upon as advisors. But first to the beginning. Zoey and Zero are two of three babies, all female, born to Yarash Squat and his wife Yofah on the 4th of April 2008. Their sister, Pammie, moved to northern Virginia when she was two months old, and there worked with the campaign from its prestigious National Capital Area office. Yarash is the son of Diddley Squat V and Lolly, making Zoey and Zero the grandchildren of the previous HFP nominee. Zero was much like her sister, with an interest in politics to match. Often quiet and thoughtful, she was uniquely suited to the vice-presidency and understood from the beginning that the "veepee" does not control the Senate. One of the two sisters' first decisions as they headed toward the formal nomination was to convince the rest of the hamster community to relocate from the east coast (Calvert County in southern Maryland) to the open spaces of the High Desert in Colorado. They actually made it past the plains to the metro Denver area and a very small cage-style apartment in a late 19th century settlement that was a Denver suburb even then. Of particular importance was the fact that hamsters are naturally desert animals, adapted over thousands of years to the high altitude and dry climate of their nation of origin, Syria. With scorching hot summer days and cool, breezy nights, their chosen state of residence was remarkably like the ancestral home of the Syrian hamster for most of the year. 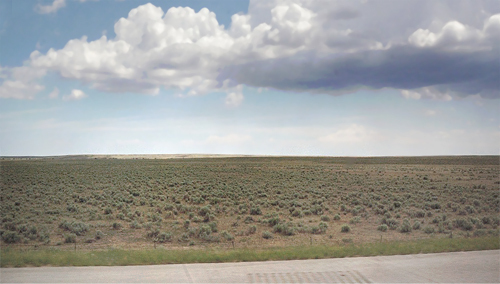 The view as seen from Interstate 70 a few miles west of Limon, Colorado. 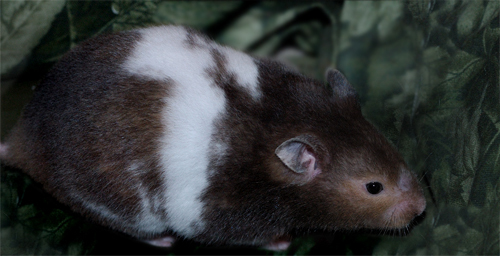 The photo, taken on the trip, is date-stamped by the camera as having been shot the day of the hamsters' arrival, 20 June 2008, at 1:09 p.m., eastern time. That would be 11:09 a.m. local. One can imagine their surprise when the ambitious rodents arrived to find a big city at the end of their trip. The trip was anything but easy. Because Zoey and Zero, their parents Yarash and Yofah, and eight other hamsters - a dozen total - were making the road trip, it had to be done driving straight through, non-stop. A son of the Great Furless One (GFO) flew by plane from Denver to Washington, DC where another son picked him up. Temporary travel cages had been purchased just for the trip and these were prepared the night before departure. Their permanent cages were dispatched to another relative in Denver to be ready for their arrival. A large and very well air-conditioned van was rented one-way to make the trip. And they left in the wee hours of the morning of the 19th of June, finding themselves a couple hundred miles from their old home before the sun even came up. The two drivers managed to go through the day and night, taking turns at the wheel. 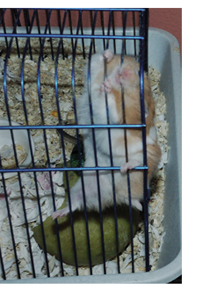 Meanwhile the hamsters got lots of fruits and vegetables to satisfy both hunger and thirst during the trip. The most trying part of the trip was the western half of Kansas, where daytime temperatures regularly reach 115 in June (which is why very few humans live there). After surviving a fierce thunderstorm riding through Kansas City that first night, they were at the Colorado state line shortly after the sun came up - and long before the insane heat set in. They settled into their old cages in the new apartment early that afternoon, none the worse for the wear - and probably grateful they didn't have to help drive. The photo at left shows Zoey gnawing the bars of her cage the evening of their arrival in their new home. Once safely in the Denver suburbs, both hamsters and GFO got surprised. (Pay attention now. This is where the rocket scientists become part of the story.) The hamsters were shocked to discover that their new home was almost exactly a quarter the size of the old one. The former had a quarter-acre of land with waterfalls, a huge pond, English-style rock garden, and nearly twice as much outdoor deck space as the entire Colorado apartment (in addition to the spacious interior). And the Colorado lodging, by comparison, was an ancient, noisy, desperately-crowded urban slum. But only humans concern themselves with such things. Hamsters don't care. But Zoey had a surprise, as well. And it was a big surprise! It seems she'd been in touch with Mensa, the exclusive organization open only to people with IQs in the top one percentile of the population. Geniuses, in other words. And, as it turned out, the organization was having its national convention in Denver that year, in early July. 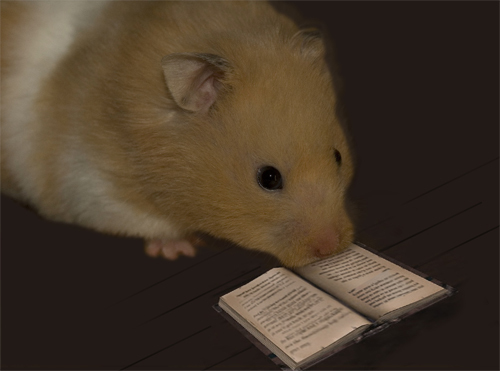 The organizer responsible for booking guests had gotten a referral to HamsterForPresident.com and was impressed. Zoey was asked and agreed to be a speaker for one of the group's workshops. She gave her presentation on the opening night, Friday the 2nd of July, interpreted by the GFO before a warm and highly supportive audience. Dozens of people came forward at the end of her talk to shake her paw and promise her their votes. 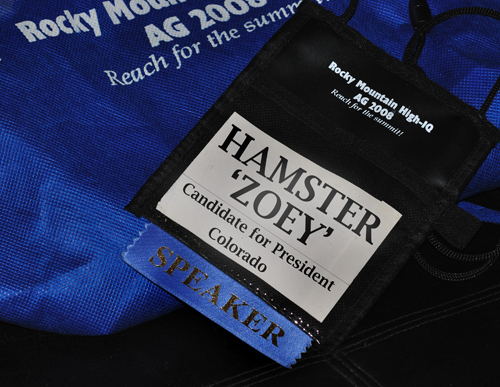 The photo shows the speaker's badge with Zoey's name and the Mensa convention slogan, "Rocky Mountain High-IQ," on it. Both speakers and attendees got the blue bags (background) with the same design. It was a very exciting week when the "human convention" (Mensa) and the week-long "rodent convention" overlapped. Starting the previous weekend, thousands of hamsters, mice, prairie dogs, chipmunks, rats, and squirrels (among others) swarmed on the historic Seed Building in lower downtown Denver. 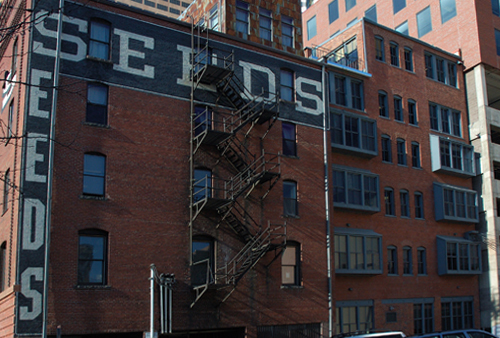 The Seed Building is conveniently located at 16th and Wynkoop in downtown Denver, a block from Union Station. For about 110 years, it's been a landmark especially popular with rodents. It served as a warehouse and distribution center for tasty seeds of many varieties. Part of the building (right in picture) is now converted to offices. While the rodents present at the Seed Building conference were overwhelmingly Colorado residents, all 50 states were represented by proxy at the event. And Zoey, now widely known because of her Mensa appearance, gave a rousing speech as she officially accepted the HFP nomination for the year 2008. Zero worked long hours, consulting experts and asking their input on the complex matters of the day. She also coordinated public opinion polls and campaign volunteer coordination. Her custom cell phone had a speaker-phone feature and one-number speed dial. For two nights after the nomination, the revelry at the Seed Building convention site continued. Finally, the hamsters went home to their communities and the campaign launched into high gear. Zoey and Zero still faced an uphill battle to get the press attention given to the other candidates. For the record, three political parties met in Denver that year - the hamsters, the Libertarian Party and the Democratic Party. The the HFP election committee did the right things even without multimillion-dollar donors - getting their tee-shirts to the masses, attending local gatherings in several states, and spreading the word via the Internet. Gabe, at left, and Bonno are the only great-grandchildren of Diddley Squat V and Lolly. Of their three sons, only Yarash (married to Yofah) produced children, and the litter was just three girls, Zoey, Zero, and sister Pammie who lived in Virginia and never married. Zoey's marriage produced no offspring, and of seven born to Zero, only Bonno and Gabe survived. Bonno remained about half Gabe's size throughout his childhood. and to this day is far smaller than his brother. But both married and produced children - Gabe's wife had thirteen, Bonno's had eleven. And their children will eventually have children of their own, keeping alive a family line going back to 1995 with the illustrious Mister Ganja and the legendary superhamster Sherman. Photo c. Jan. 2009. 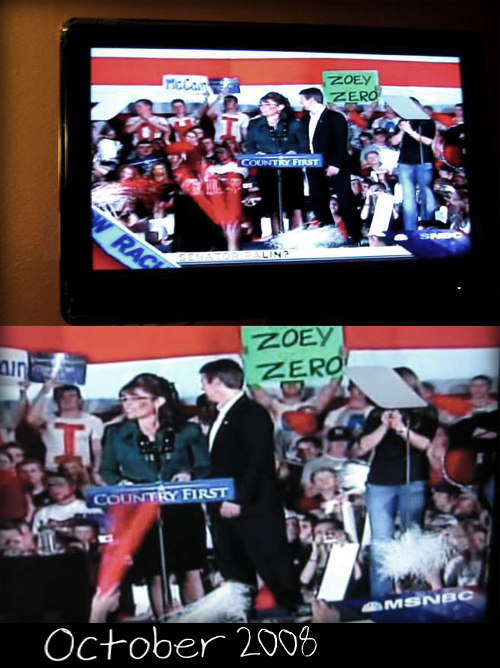 A demonstrator showed up at a McCain-Palin rally in late October of 2008, flashing a hand-written "Zoey & Zero" sign on the podium. A moment later, HFP supporters in the audience began to chant the new campaign mantra: "You don't have to be a genius to vote hamster, but it helps!" It took 15 minutes to find and evict them all and the small auditorium was about half-empty when it all settled down. The photos above are of a television screen tuned to the news. But the popularity of the hamster candidates got an enormous boost in late August when the Republican contender chose an unlikely and little-known vice presidential candidate. From the start it was plain that she was in over her head. When interviewed by a popular TV news reporter, her inability to answer questions and her peculiar way of garbling a sentence had the public comparing her, most unfavorably, with the Zoey-Zero voters at the opposite end of the IQ scale. Campaign tee-shirts were one way of attracting public attention to the Hamster For President philosophy and the election effort. But at the end of the day, the scattered-brained "veepee" wannabe and her real-life "Lily Tomlin routine" (for those old enough to remember "Laugh-In" from the 1960s) may have proved more a liability than an asset to the hamsters. Independent voters and even some of the hamster constituency were frightened enough to cast their votes for the major party opposition. In a rare and extremely "un-presidential" moment, Zoey sticks out her tongue at the television to express her disgust with the human side of the campaign, especially during the weeks immediately leading up to the election. Both she and Zero were excluded from the presidential and vice-presidential debates. Zoey and Zero were both unusually large hamsters or "hamazons," as the press dubbed the sisters. Both weighed close to eight-and-a-half ounces. 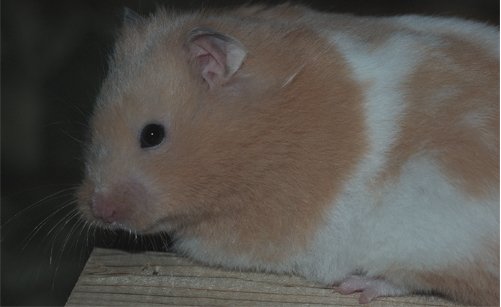 The usual weight for a hamster is around 6 to 7 ounces. 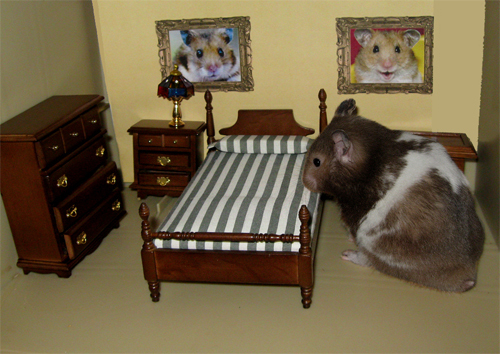 The furniture pieces in the photo are actually "hamster house" miniatures. But Zero and sister Zoey really were big. As the campaign wound down, Zoey and Zero went on to live very normal hamster lives. Zoey was married on 28 October 2008 to her long-time sweetheart, Bailey. Though they had a very romantic honeymoon, the couple never produced any children. Zero had married on the 10th of October to Langolier, affectionately known as "Langy." Their first honeymoon did not result in pregnancy. But the second did. And a litter of seven infants was born the 28th of November. But even then all did not go smoothly. Campaign stress and mature age at first breeding took their toll. Before a week was up, Zero had stopped producing milk and the newborns - developed only to the normal size of four or five day-olds, began dying off. When Zero sadly shoved the fourth deceased baby from the nest, the GFO had to make a very hard decision - the deision to hand feed them. Only three males were left and one was so sadly bloated from hunger that he was beyond even a miracle. Newborn hamsters weigh one fifteenth of an ounce (or two grams), which means that a relatively large litter of twelve would weigh in at barely .8 ounce - eight tenths of one ounce - and this is twelve of them together! By the fourth day, at which time these infants appeared to have stopped growing, they are already between two and three times their birth weight. But that is still tiny! They are too small, in fact, to take milk from an eyedropper. So the goat milk (which is lactose free and nourishing to hamster babies) was given in a tiny tube (see enlarged photo below) along with a dose of beneficial immune system boosting bacteria. Zero's babies were fed from a tiny tube of Bene-Bac, a probiotic that is very good for the immune system of a hamster. The tube itself holds only one gram of the gel, which is practically microscopic. But the very small tube also can be used to put tiny amounts of goat milk into the mouths of babies little enough that they could choke on or inhale that excessively-large amount that humans call a "drop." With the acidophillus that came in the tube, the milk saved the lives of Zero's two sons. The gel is made by a company called Pet-Ag and is available at many pet stores. 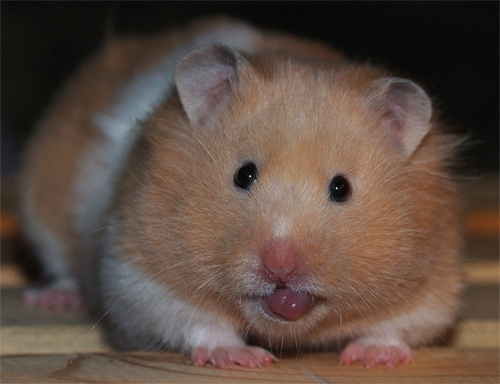 It can prevent illness caused by stress, something both common and deadly among young pet store hamsters. At first the babies were fed and put back into Zero's nest for warmth. But Zero was in great distress and finally, reluctantly, she agreed to turn the entire job over to the GFO, acting as an advisor. Of the three initial survivors, the size difference was remarkable. The largest was white in color (like his father); the smallest was less than half the size of the largest and was dark gray (like his mother without the band); the sickest one, in between the others in size, looked like his mother but with more white. He died before he was able to get any milk. The other two had to be fed tiny amounts of milk every half hour for the first 18 to 24 hours, and then every hour for another day and every two hours another 10 or 12 days. They also had to be kept in an incubator made of clear plastic lined with blankets and covered with towels and placed on a heating pad. And they developed far more slowly than hamsters raised by their mother alone. But eventually they wre able to lick little bits of mush (goat milk thickened with baby cereal flakes) from a human fingertip. Finally the two infants pulled through and started eating seeds. Four weeks after their birth, they were at a stage normal for two weeks, but capable of surviving with minimal special help. They were named Bonno and Gabe (see photo, lower left). Above you see a mature Zoey perched on an orange crate that served as a "roost" for her when she was out of her cage. She never lost her hefty body or youthful beauty and both she and sister Zero lived far beyond the normal life expectancy of a female Syrian hamster. Zoey remained active and cheerful and youthful in appearance all her life. She died early the morning of June 4th, 2010 - her 26th month birthday. Zero lived even longer, though in her last months she was progressively crippled with arthritis. Her death came 15 days after her sister's, on the 19th of June, 2010. Both sisters are buried with their parents, husbands and other family members at a private pet cemetery in Aurora, Colorado.